Measure www.getmeasure.co.uk is an app that lets bar owners track their stock efficiently, making their inventories much less time-consuming and costly. 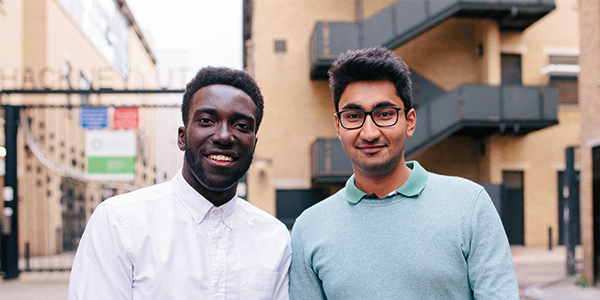 Founders Nathanial and Nayan talk to us about how they have been developing this idea since taking part in Big Idea as finalists and then in Launchpad last year. Did you ever think you would start your own business? Yes, I think, me personally, I always wanted to start my own business. It was just a matter of finding the right people to do it with. You know you’re far better off in a team than on your own. What would you tell students who are thinking of entering either the Big Idea challenge or the Launchpad programme? I’d say, definitely go for it if you are serious about starting your own business and you haven’t gotten a lot of experience, which most of us don’t. This is the perfect place to get your idea validated. To get real understanding of what it takes. What did the Launchpad programme do for your idea or company? So, the Launchpad programme gave us loads and loads of advice on how to test our idea, how to make sure it’s going to be good and that people will want to buy it. Also, the ways to validate it, so going out to the bars and talking with the owners and employees and not directly asking if our idea is good but just seeing what they find difficult in their workplace. So, it helped us think how our idea could help them fix their problems. How has your life changed since starting a business? Our lives are a lot busier and more exciting – we are trying to work towards working on Measure full time. Whenever we have free time we go to meetings and work on developing the app at weekends and evenings. How closely do you work with Accelerator? We still have a great relationship with them and are in constant communication. We have lots of good conversations and some really decent mentoring. They are still very much involved in our success. What are your goals for your company in 2017? We’ve got quite a few. We’ve got some demos lined up so hopefully we can convince them that this is the software for them. And of course, going out and introducing ourselves and trying to get a lot more bars on board. How many bars do you currently have using Measure across the city? We have a chain of 20, and then a few more – 25 different bars. What makes Measure different from your competitors? We’ve got a few competitors, mainly in America. So, we were quite heavily influenced by them and the stuff going on over there. They do very similar things but we hope to be the first in the UK and set up shop before they come to expand. Measure is also quite different in that we are trying to create and online dashboard, we are trying to make it into a visual representation. So, you can see the analytics and behind each drink. It’s about gathering the data behind the bar and showing the bars where their strengths and weaknesses are. Your business seems to be a little different from when you entered the Big Idea challenge, why is this? How has your idea evolved? Our first idea was ‘Woo’ – the drinks based ordering service. That was where you could order drinks from your table and go pick up the drink when it’s ready to get rid of queuing for drinks. Then on the last day of Launchpad we decided we are going to pivot – meaning changing our idea. But none of the research was a waste. We learned so much just going through Launchpad and getting Woo going. And now we can put all that knowledge and insight into Measure and help it to grow.